Service Costs > How Much Does In Dash Navigation Installation Cost? How Much Does In Dash Navigation Installation Cost? Navigation installation is the process of installing a GPS navigational system in your vehicle’s dashboard instead of using a portable unit. How much does a dash navigation installation cost? Installation rates can vary anywhere from $150 to $400 for the complete job and will not include the GPS unit. The cost will depend on the complexity of your setup and the professional you choose. Some will charge by the project, while others, even though it’s rare, may charge by the hour. Including the unit, the total price can be $500 to more than $2,000. Edmunds, for instance, claims a system can cost $300 to $1,300, plus another $250 for the installation. These are all prices for those who want an aftermarket part installed. Now, if we’re talking about a brand new car and upgrading to a model that has a navigation system, this could be an additional $1,500 to $4,000 or more, depending on the car’s make and model. Extremetech.com says a BMW 3 Series could cost $1,900, while the Lexus ES system can cost another $2,675. Best Buy, for example, charges 100 to install an in-dash navigation or in-dash video system. Car Toys charges $150 if the unit doesn’t have Bluetooth and $200 if the unit has it. An in-dash navigational system will have more features, a better screen and can be highly customizable. Many third-party navigation systems are geared toward techies and audiophiles who want a sleeker look than a factory-based unit. These systems can have many features that the factory unit doesn’t have such as Android Auto, Pandora streaming and Apple CarPlay. The screen has also been said to be higher in resolution, offering flashy colors and animated menus. Jobs will require removing the dash panel, installing a new GPS antenna, connecting the wiring harness, installing a new antenna adapter, mounting kit and if Bluetooth is needed, a microphone will be installed near the visor. On average, it can take two to four hours to professionally install a navigational system. If additional parts are required, such as a wiring harness and dashboard kits, this charge can cost anywhere from $40 to $60. A material charge can cost anywhere from $5 to $15 and will be assessed at the time of the installation. These navigation systems will require an update every few years and can cost $75 to $200 for the update CD. Any modifications that may be needed can add to the total bill. This can include damaged factory wiring, bypassing extra wiring harnesses, creating a custom mounting bracket if not installation kit is available and if you want your new system to interact with your steering wheel. Aftermarket navigation systems are the second most common thing to get stolen since thieves know how much these units cost and how easily they can be removed from the car. 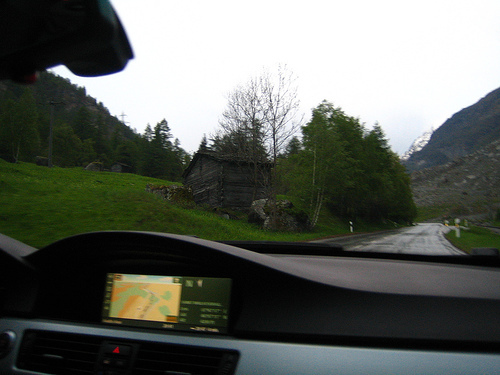 If you’re a fan of having everything flow on your dashboard, you may be disappointed with most aftermarket navigation systems, since most, unfortunately, won’t look as if it were part of the car’s design, Depending on the model you buy, you may also lose some features such as steering wheel music volume and traction controls, but some companies do offer adapters, which cost about $40, that enable you to keep this capability. In-dash navigation units can be pricey, will need updates and will have usage limitations. Plus, they are theft prone and not fully integrated. Because of this, some experts recommend sticking to your smartphone or even purchasing a simple portable GPS. A good GPS can cost less than $250 and can mount to your windshield. While it won’t look as sleek, it can save you a few hundred dollars. If you purchase the navigation system from a retailer, they may offer you an installation discount if you use their services.